Ask fellow campers about "Huggy Bear Campground" and nearby attractions. 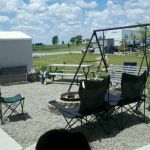 This is a very large RV park with mostly seasonal campers in a variety of large trailers, fifth-wheels and park models. There are many large, level pull-through sites with FHU's in the new section for short term stays. Unfortunately you have to drive through the cramped older part to get to the new area. Check in was quick and they have a nice store. There are lots of activities including 2 fishing ponds, 2 swimming pools, a splash pad, and many other things. Bathrooms and laundry room were clean. The whole park is well kept up. All of the roads and sites are gravel. We camped at Huggy Bear Campground in a Motorhome. Are you affiliated with Huggy Bear Campground ?